How to setup Safe Cracker to recognise magic tokens ? As you can already read on my game review, Safe Cracker is a very special game. One of the custom parts of this game is that it accepts 'magic tokens'. The whole setup and wiring to accept this token is also unique to this game. There is not a lot of documentation available, so if you have a game that doesn't accept the magic tokens, it can be difficult to find out what you have to change. So here's all information I know about how this was implemented and how you can get the magic tokens working. To be able to recognize tokens in addition to coins (regular 3 slots and dollar bill acceptor), Williams designers had to use a few tricks to add an additional coin, as there just wasn't anything available for it in the WPC hardware or switch matrix. Import or export pinball machine ? Import version (USA model): has a coin door with two mechanical slots: one for quarters, one for magic tokens (indicated with decal). Export version (European): coin door with 1 slot and electronic coin mech. Exported import versions: SafeCrackers made for the american market but exported to Europe. These last types can be recognised as they have all decals for 110v, indicating they are made for the USA, but have been changed at the factory for 220 volts and been relabeled as such. They also have an american style coindoor with 2 slots. As far as I know, they have one mechanical coin mechanism (for tokens) and an electronic coin mech (for coins). 2 people told me on their game an electronic coin validator was installed, but the second coin chute blocked (and no mechanical coin mech for tokens was installed). I don't think they came that way from the factory, but were probably changed by distributors or operators to completely disable magic tokens. It's important to know what setup you have - but every game can be converted to accept mechanical coins. USA games should have by default all the correct wiring installed. So unless this has been hacked/removed you don't have to make any changes to the wiring as explained below. I have a regular export version with only an electronic coin mech (which is programmed to accept German Marks and Magic Tokens). Most information in this article I found out when helping someone who had an exported import version, but of which the complete wiring for the mechanical magic token switch had been removed- he only had an electronic coin mech but was not able to accept magic tokens. If you have an electronic coin mech and want to add an extra mechanical switch to accept magic tokens, here's everything you need to know..
Let's first start with the easiest part, the software. First thing you have to check is to see if coins and tokens are recognised in the switch tests. Because no matter what other software settings are used (tokens disabled, tokens award a regular credit, ..), their switches still have to register in the switch test. So our first task is to check if they register in the switch test. If they don't, there's something physically wrong with the wiring. If they do show up correct, the wiring is ok and it's only a matter of finding the correct software adjustments. This picture shows what the dot matrix display looks like when you set a pinball machine in T.1 - switch edges. In the box you see the 8 by 8 switch matrix. What interests us however are the two extra columns, far left and far right. These are the direct input switches to which the coin switches are connected. WPC pinball machines are able to be installed with coin doors with a maximum of 3 coin mechanisms (3 chutes: left, middle and right). In addition a bill validator can also be added as 4th coin chute. In the switch matrix these are the top switches on the first (most left) column. So if you throw a coin in, it should register. Left chute will be the top left switch. Middle the one under it, .. Both mechanical coin mechs or electronic coin mechs should register the same way in the switch matrix. Note there are dipswitches on the coin door interface board (the board at the left side inside the cabinet near the coindoor). These dipswitches are used to enable or disable certain coin chutes. So if all wiring looks to be correct but a coin switch doesn't register, make sure all dipswitches are set to 'on' position (check wiring schematic in the manual). As the WPC software (and hardware) wasn't created to have a 5th coin (magic token), designers had to 'hack' the magic token switch input into the WPC system. They did this by reusing the switch input of 'upper left flipper opto' as a magic token. This switch registers at the extreme bottom right. So in the display: column 10 (the right extra column), bottom switch. If a magic token is recognised, this switch will register (and SafeCrackers game software knows to interpret this switch as a magic token). If all coins and magic tokens register well, it's only a matter of software adjustments to enable magic tokens. There are several game software revisions and from what I hear, some have additional options. One version (probably the latest) has in the menu option A2.22. if you have it, make sure it is set to have tokens enabled. There probably is another option too to enable or disable tokens. The easiest thing to do if you are not sure if the settings are correct, is to do a factory reset. This will default every setting and as a result, magic tokens are enabled. In home use you probably want to set it to free play after doing a factory reset. You can set the game to Free Play without any problems. If tokens are recognised well, they will still give magic credits (and are indicated on the screen) to start the special game. So it's not necessary to have working coin mechanism and set the game to pay-to-play to be able to use magic tokens. As long as you have magic credits, the special game will start. Once you run out, it's regular free play and you can start as many 'regular' games like you want. As we've seen in the software part, Williams designers have reused the upper left flipper opto switch for the magic token coin switch. The hardware on a Safe Cracker pinball machine is also changed to make this possible. Safe Cracker uses a special type of coin door interface board, part number A-20949. Picture by Branko Prijs. Ignore the black and red wires that are soldered directly onto the board, these go to an optional counter. What is important to us is connector J13. 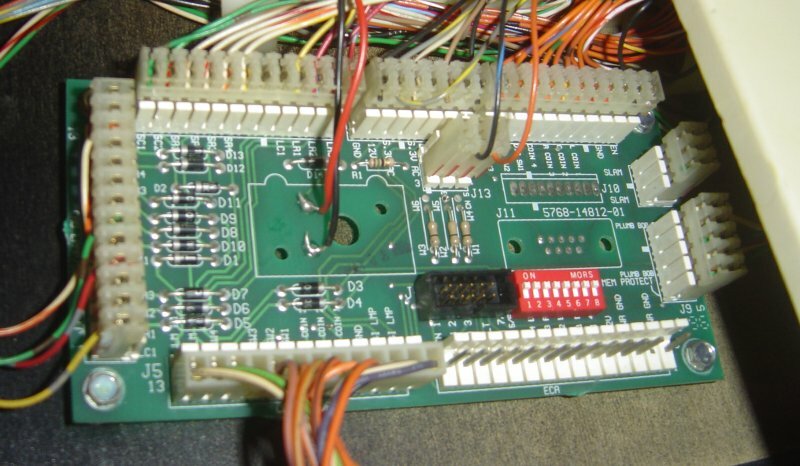 The most important change compared to older interface boards is the addition of an extra connector: J13. On the schematics of the board (Safe Cracker manual pages 3-31 and 3-32) the connector is indicated as '5th coin to cpu'. This is the switch input for the magic token coin mechanism (which goes to the 'upper left flipper opto switch' input on the cpu. First make sure this connector is plugged in. It should have 2 wires, orange and one black/blue, and key. If you briefly connect both wires to eachother, they should register in the switch test as the magic token / bottom right, as described above. They you know the wiring from the connector towards the cpu is correct. >orst case, ie if you don't have the correct coin door interface board installed in your game, you can just bypass the board and connect a mechanical switch directly onto this connector. On European games (maybe also USA games ? ), by default this extra coin switch is connected to the inputs of the electronic coin validator (flatcable to connector J4). If you want to re-use one of the mechanical coin mechs (chutes 1 to 3) to accept magic tokens, you will have to add a jumper. Check the schematics to see where it has to go. The weird thing is that according to the schematics, all that's needed is a jumper between W3-W6, W2-W5 and W1-W4. However the board default comes with zero-ohm jumpers installed and it doesn't see magic tokens when regular coin switches are activated ? Here's an example of someones board is modified so the left coin mechanism has been switched over to register as magic tokens. All what was needed to do was add a jumper wire from J5-4 to J13-2. Picture by Oscar Van Driel. If you only have an electronic coin validator which doesn't recognise magic tokens (or any other tokens), you have two options. Add a mechanical switch and hook it up as described above. If you have a coindoor with only one slot, then you have to find someone who is able to reprogram the coin validator. Important to know is that the magic token has to register on channel 5.